Denmark has such an incredible legacy when it comes to mid-century classic design with the likes of Hans J. Wegner, Arne Jacobsen, Georg Jensen to name a few, that it’s almost impossible not to find a beautiful, place to stay and here are two of my favourite inspiring and family-friendly places to stay. 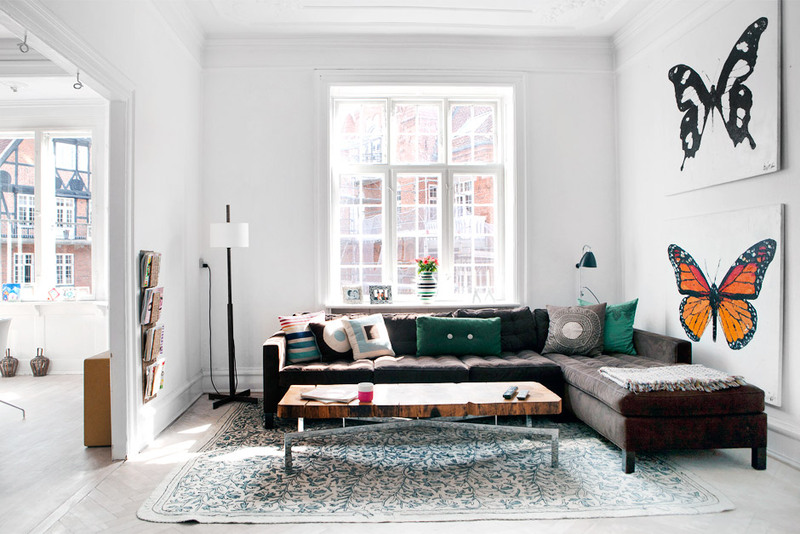 Located in Copenhagen’s old town, the Christian Ixth Residence is great for two adults, 2 children and a baby. It’s in the centre of town (Indre By as they say) and walking distance from all the shops and museums (except Louisiana which you must visit). It has gorgeous floorboards, lots of natural light and I think these large butterfly paintings by Hong Kong artist Simon Birch are stunning. This one is out of town in Valby but since Copenhagen is a small city, it doesn’t really matter if you’re not staying in the centre of town (Indre By). By tube, most journey will take you 8-12 min and 20-30 min to the airport and most owners lend some bikes to so you can experience a proper Danish lifestyle for a few days. The Steenbergsvej Residence is a beautiful house running on fourth floor and if you’re lucky enough to have the same amazing weather I had last week, you will love hanging out in the garden too. La première est au centre de Copenhagen (Indre By comme ils disent) et la seconde est en banlieu mais Copenhagen est une petite ville donc même en banlieu, vous ne serez qu’à 8-12 min du centre en métro ou bus et puis si vous avez la chance d’avoir le temps que j’ai eu la semaine dernière, vous apprécierez beaucoup le joli jardin de cette maison qui est sur quatre étages. So glad you like them Emily and how fab you’re off there. Is it your first name there?